NOTICES FILINGS TODAY FOR APRIL CONTRACT MONTH: 34 NOTICE(S) FOR 3400 OZ. You can see for yourself the total falsification of data in the jobs report. Actually the real number was a huge loss. However the attack on Friday was pre-ordained as the gold OI was getting frothy and the silver OI stubbornly remained at extreme lofty levels. As a little bonus, because I am writing this on Saturday, we get to see the preliminary numbers released close to midnight last night for the Monday trading day. The open interest for the gold complex fell by 7911 contracts down to 449,868. With the $10.50 drop in gold this was to be expected. When the final numbers come in on Monday it will drop even further. To highlight the frustration by the bankers with respect to silver, you only have to look at the OI for silver. With the huge 34 cent drop one would have expected the OI to drop considerably. Nope!! it rose by 300 contracts despite the shellacking silver took. In silver, the total open interest FELL BY 1605 contracts from 206,233 DOWN to 204,833 WITH THE FALL IN THE PRICE THAT SILVER TOOK WITH RESPECT TO YESTERDAY’S TRADING (DOWN 10 CENT(S). WHEN YOU COMPARE THE HUGE GAIN IN OI FOR GOLD THEN YOU MUST ADMIT THAT WE MUST HAVE HAD SOME BANKER SHORT COVERING WITH THE MAJORITY OF OUR LONGS BASICALLY REMAIN STOIC AND LOSING SOME OF THEIR SILVER LEAVES FROM OUR SILVER TREE. In ounces, the OI is still represented by just OVER 1 BILLION oz i.e. 1.024 BILLION TO BE EXACT or 146% of annual global silver production (ex Russia & ex China). we had: 34 notice(s) filed upon for 3400 oz of gold. IN THE LAST 16 DAYS: GLD SHEDS 50.1 TONNES YET GOLD IS HIGHER BY $45.20 . GO FIGURE!! 1. Today, we had the open interest in silver FALL BY 1605 contracts from 206,233 down to 204,833 (AND now A LITTLE FURTHER FROM THE NEW COMEX RECORD SET ON FRIDAY/APRIL 21/2017 AT 234,787). THE FALL IN OPEN INTEREST WAS ACCOMPANIED BY A SMALL LOSS IN PRICE FOR SILVER WITH RESPECT TO YESTERDAY’S TRADING (DOWN 10 CENTS ). WHEN WE SEE THE GOOD SIZED RISE IN GOLD OPEN INTEREST YESTERDAY, WE NO DOUBT WITNESSED SOME BANK SHORT COVERING AS THEY THOUGHT THE TEMPERATURE WAS A LITTLE TOO HOT FOR THEM. WE NO DOUBT HAD SOME NEW SPEC LONGS ENTER THE ARENA. THE MAJORITY OF THE LONGS REMAIN STOIC AND NOTHING IN THE WORLD WILL FORCE THEM OFF THE SILVER TREE. Mish Shedlock comments on the missing piece on global inflation. Actually we are experiencing inflation but not what the bozos want: wage inflation. i)the official jobs numbers: a beat by 209,000 jobs. All of the gains were of the “seasonable adjustment” category. Adjusted saw a 1.3 million decline. Shear nonsense! v)The last word on the phony jobs report courtesy of Dave Kranzler. One of the key numbers of the fake phony numbers is the Birth Death plug. For our newcomers, the BLS records the losses of jobs when businesses die (Death), then they pick out of thin air, their guess as to new businesses created. The net difference is the B/D and even though there has been a huge decline in new businesses over the past 40 years, these bozos always give a huge increase and this is a total falsehood. To give you the absurdity of the numbers; this week, the construction industry report showed a huge 10% drop in June. The bozos in the B/D added 10,000 construction jobs in June. The real answer then for the jobs report is huge decline in meaningful jobs. The total gold comex open interest ROSE BY A GOOD SIZED 2174 CONTRACTS UP to an OI level of 457,779 DESPITE THE FALL IN THE PRICE OF GOLD ($3.65 with THURSDAY’S trading). We again had a good sized number of newbie longs enter the gold area to which our crooked bankers were more than happy to comply with an ever increasing supply of short paper. The specs shorts covered as fast as their feet could carry them.The result a higher open interest despite the lower price. The active August contract LOST 24 contract(s) to stand at 2728 contracts. We had 73 notices filed upon yesterday so we gained 49 contracts or an additional 4900 oz will stand at the comex and 0 EFP’s were issued which entitles the long holder to a fiat bonus plus a futures contract and most probably that would be a London based forward. The non active September contract month saw it’s OI gain by 93 contracts up to 2013. The next active contract month is Oct and here we saw a gain of 301 contracts up to 48,534. The very big active December contract month saw it’s OI rise by 1535 contracts up to 352,825. We are now in the next big non active silver contract month of August and here the OI FELL BY 2 contracts DOWN TO 209. We had 2 notices filed yesterday. Thus we gained 0 contracts or an additional NIL oz will stand for delivery in this non active month of August. The next active contract month is September (and the last active month until December) saw it’s OI fall by 3582 contacts down to 133,913. The next non active contract month for silver after September is October and here the OI gained 3 contacts up TO 31. After October, the big active contract month is December and here the OI gained by 2035 contracts up to 61,226 contracts. Today, 0 notice(s) were issued from JPMorgan dealer account and 0 notices were issued from their client or customer account. The total of all issuance by all participants equates to 34 contract(s) of which 0 notices were stopped (received) by j.P. Morgan dealer and 2 notice(s) was (were) stopped/ Received) by j.P.Morgan customer account. To calculate the initial total number of gold ounces standing for the AUGUST. contract month, we take the total number of notices filed so far for the month (3246) x 100 oz or 324,600 oz, to which we add the difference between the open interest for the front month of AUGUST (2752 contracts) minus the number of notices served upon today (34) x 100 oz per contract equals 589,300 oz, the number of ounces standing in this active month of AUGUST. we gained 49 contracts or an additional 4900 oz will stand for delivery and 0 EFP’s for August were issued. This is a welcomed change: gold early in the delivery cycle month not accepting an EFP and there is still a considerable 18.4 tonnes of gold standing. We had 23 tonnes of registered or for sale gold at the gold comex. Over a year ago the comex had 303 tonnes of total gold. Today the total inventory rests at 269.84 tonnes for a loss of 33 tonnes over that period. Since August 8/2016 we have lost 84 tonnes leaving the comex. However I am including kilobar transactions and they are very suspect at best. IN THE LAST 11 MONTHS 84 NET TONNES HAS LEFT THE COMEX. Thus the INITIAL standings for silver for the AUGUST contract month: 543 (notices served so far)x 5000 oz + OI for front month of AUGUST(209 ) -number of notices served upon today (130)x 5000 oz equals 3,110,000 oz of silver standing for the AUGUST contract month. This is extremely high for a non active delivery month. Silver is being constantly demanded at the silver comex and we witness again the amount of silver increases daily right from the get go. We gained 0 contracts or an additional nil oz wishes to stand for delivery in this non active month of August and again 0 EFP’s were issued for the silver August month. YESTERDAY’S CONFIRMED VOLUME OF 65,274 CONTRACTS WHICH EQUATES TO 326 MILLION OZ OF SILVER OR 47% OF ANNUAL GLOBAL PRODUCTION OF SILVER EX CHINA EX RUSSIA). IN OUR HEARINGS THE COMMISSIONERS STRESSED THAT THE OPEN INTEREST SHOULD BE AROUND 3% OF THE MARKET. 1. Central Fund of Canada: traded at Negative 7.9 percent to NAV usa funds and Negative 8.0% to NAV for Cdn funds!!!! Note: Sprott silver trust back into POSITIVE territory at +0.23/Sprott physical gold trust is back into NEGATIVE/ territory at -0.67%/Central fund of Canada’s is still in jail but being rescued by Sprott. *LAST 145 TRADING DAYS: A NET 5.41 TONNES HAVE NOW BEEN WITHDRAWN FROM GLD INVENTORY. *FROM FEB 1/2017: A NET 22.22 TONNES HAVE BEEN WITHDRAWN. July 10/ A HUGE INCREASE OF 2.931 MILLION OZ OF SILVER DESPITE THE EARLY HIT ON SILVER THIS MORNING/INVENTORY RESTS AT 344.662 MILLION OZ. July 6/ANOTHER MASSIVE DEPOSIT OF 2.126 MILLION OZ INTO THE SLV INVENTORY/INVENTORY RESTS AT 341.731 MILLION OZ. July 3/strange! with the huge whacking of silver we got an increase of 379,000 oz into inventory. Here is a review of the 3 latest comex waterfall (whacks) on gold and silver not including the current one we are undergoing. I have taken the nadir of the gold price before it started to rise again and compared it to OI in both gold and silver with the OPEN INTEREST. The OI readings are the following day but we are always one day behind so this compares exactly to the nadir price. It seems the data suggests power manipulation to control the price through paper! At 3:30 pm we receive the COT report. This report is as of Tuesday August 1.
commercials go net short 40,000 contracts and this set up Friday’s raid. It was all pre ordained. Conclusions: reason for the raid on gold yesterday.it will all pre ordained. those large specs that have been short in silver covered a huge 9948 contracts from their short side. those commercials that have been short in silver added 6953 contracts. commercials go net short by only 10,000 contracts..still have considerable trouble trying to cover their huge shortfall in silver. those small specs that have been short in silver covered 187 contracts from their short side. Conclusions; reason for the whack in silver yesterday; the extremely high oI and the lack of shedding by the longs. Gold held steady today in Asian and European trading and was flat for the week, consolidating near the $1,270 per ounce level and the 2.5% gain seen in July. It remains close to a seven-week high hit this week, as the dollar remains weak and vulnerable near multi-month lows after five consecutive months of declines. The dollar index, which tracks the greenback against a basket of six major peers, is languishing near 15-month lows hit earlier this week. “All eyes” are again on the monthly U.S. nonfarm payrolls data due today amid continuing very high levels of U.S. and global political uncertainty. Traders awaiting July’s employment repor for clues about the health of the U.S. economy after recent data highlighted risks to the downside. This is underlining how difficult it will be for the U.S. Federal Reserve to raise interest rates – even from these historically low levels in the current range between 1% and 1.25%. The complete mess that is the Trump administration and U.S. politics was underlined again this week. Robert Mueller, the U.S. Special Counsel, has convened a grand jury investigation in Washington to examine allegations of Russian interference in last year’s contentious election and has started issuing subpoenas, according to sources familiar with the situation said on yesterday. The dollar looks very vulnerable to further falls. Trump and the Republicans have seen repeated failures. These include overhauling healthcare. Now there is multiple congressional and federal investigations into President Donald Trump’s campaign. This is casting a shadow over his first six months in office and the vicious “civil war” politics that the U.S. finds itself in is casting a shadow over U.S. politics and America’s place in the world. 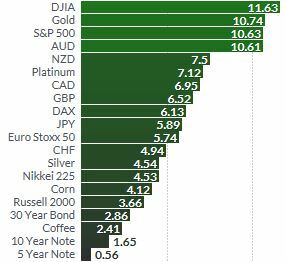 Gold is performing very well this year and yet sentiment remains poor with little media coverage of gold’s robust performance year to date. Gold has outperformed stocks and the benchmark S&P 500 YTD with gains of 10.8% versus a 10.6% gain in the S&P 500. Much of the gains are due to surge in prices in the increasingly frothy tech sector. Indeed, gold is outperforming stocks globally – the Euro Stoxx 50 is up 5.7% ytd, the FTSE up 4.8% and the Nikkei up 4.5%. Silver gained 1% in July and is 5% higher so far this year. Gold’s technicals look very good and it now trading above its 50-day and 200-day moving averages and looks set to target $1,300 again this month. A daily or weekly close above $1,300 per ounce should see gold make quick gains and challenge the intermediate high of $1,361/oz seen 13 months ago. Next levels of resistance are $1,380 and $1,416. A failure to breach $1,300 in the coming days and weeks could see gold fall back to test very strong support at $1,200 per ounce. Wednesday evening at 7:06 EST, at one of the least liquid trading periods of the 23 hour trading day for Comex paper gold, a “motivated” seller unloaded 10,777 August gold contracts into the CME’s Globex trading system, knocking the price of gold down $9 in 25 minutes. There were no obvious news or events reported that would have triggered any investor to dump over 1 million ozs of gold with complete disregard to price execution. Rather, the selling was the act of an entity looking to push the price of gold a lot lower in “shock and awe” fashion. The 10.7k contracts sold were just the August contracts. There was also related selling in several other contract months. To be sure, the total number of contracts unloaded included hedge fund selling from stop-losses triggered in the black boxes of momentum-chasing hedge funds. In addition to the appearance of frequent, strategically-timed “fat finger” flash crashes, the open interest in paper gold on the Comex has soared by 23,000 contracts since last Friday. This added 2.3 million paper gold ounces to the Comex open interest, which represents nearly 27% of the total amount of alleged physical gold ounces sitting Comex vaults. In fact, the total paper gold open interest on the Comex is 455,605 contracts, or 45.5 million ounces of gold. This is 530% more paper gold than the total amount of gold reported to be sitting in Comex vaults. The dramatic rise in open interest accompanied gold’s move in price above the 50 dma. 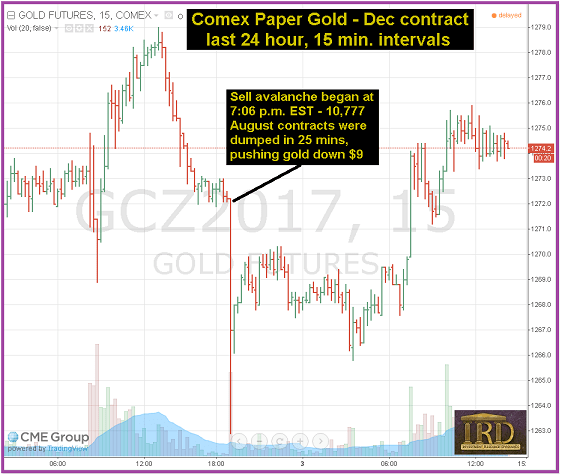 It’s typical for the bullion banks on the Comex to start flooding the market with additional paper contracts in order to suppress strong rallies in the price of gold. Imagine what would happen to the price of gold if the regulatory authorities forbid the open interest in Comex gold contracts to never exceed 120% of the total amount of gold in the Comex vaults. This is unwritten “120% rule” is de rigeur with every other commodity contract except, of course, silver. 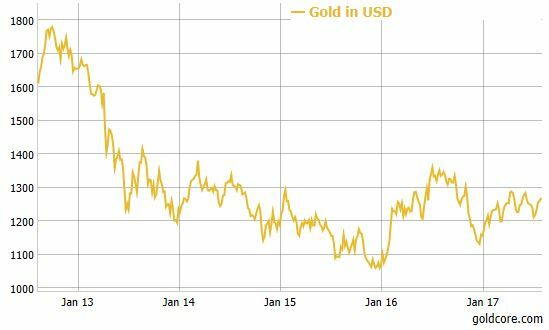 The “flash crash” and “open interest inflation” are two of the obvious signals that the western Central Banks/bullion banks are worried about the rising price of gold. The recent degree of blatant manipulation reflects outright fear. I suspect the fear is derived from two sources. First is a growing shortage of physical gold that is available to deliver into the eastern hemisphere’s voracious import appetite. Exports from Swiss refineries have been soaring. India’s appetite for gold has not been even slightly derailed by the 3% additional sales tax imposed on gold. Speaking of India, the World Council has put forth a Herculean effort to down-play to amount of gold India has been and will be buying. After India’s 351 tonnes imported in Q1, the WGC tried to shove a 90 tonne per quarter forecast down our throats for the rest of the year. India’s official tally for Q2 is 167.4 tonnes. Swing and a miss for the WGC. Now the WGC is forecasting at total of 650-750 tonnes for all of 2017. The WGC forecast is idiotic given that India officially imported 518.6 tonnes in 1H and 2H is traditionally the best seasonal buying period of the year AND a copious monsoon season means that farmers will be flush with cash – or rupees, rather – which will be quickly converted into gold. Two more swings and misses for Q3 and Q4 and the WGC is out of excuses for why India likely will have imported around 1,000 tonnes, not including smuggled gold, in 2017. This aggressive misrepresentation of India’s gold demand reeks of propaganda. But for what purpose? Back to the second reason for the banks to fear a rising price of gold: the inevitable collapse of the largest financial bubble in history inflated by Central Bank money printing and credit creation. The trading action in the gold and silver markets resembles the trading activity in 2008 leading up to the collapse of Lehman and the de facto collapse of Goldman Sachs. One significant difference is the relative effort exerted to keep a lid on the price of silver. In early 2008, with the price of silver trading between $17 and $19, the open interest in Comex silver peaked at 189k contracts (Feb 29th COT report). Currently the open interest is 206k contracts and it’s been over 240k. In late 2008, the Comex was reporting over 80 million ozs of “registered” silver in its vaults. “Registered” means “available for delivery.” There were thus roughly 3 ozs of paper gold for every reported ounce of physical gold available for delivery. Currently the Comex is reporting 38.5 million ozs of registered silver. That’s 5.3 ozs of paper silver for every ounce of registered silver. As you can see, the relative effort to suppress the price of gold and silver is more intense now than in 2008. Given what occurred in 2008, I have to believe that fear emanating from the western banks currently is derived from events unfolding “behind the curtain” that are worse than what hit the system in 2008. The latest gold withdrawal figures from the Shanghai Gold Exchange(SGE) suggest that demand is up on last year’s figures by 3.5% in the seven months to July, but even further down on the record 2015 figure which was almost 23% higher at this time of year. We would expect this gap on 2015 to widen further through the current quarter as month by month SGE gold withdrawal figures were particularly strong at this time two years ago. While SGE withdrawal figures are contentious as far as Chinese gold demand estimates go, they do equate to demand as delineated in the Chinese Gold Yearbook and the annual total is far closer to the sum of known Chinese gold imports (from official data from gold exporting entities) plus China’s own gold production, plus a small estimate for recycled gold, than estimates of Chinese demand by the major precious metals consultancies which seem to be restricted to certain demand parameters. In other words, the SGE gold withdrawal figures are far closer to known gold flows into the Chinese mainland. Overall, given the second half of the year tends to be stronger in terms of demand than the first, it looks as though Chinese full year demand this year will be in the order of 2,000 tonnes, based both on SGE withdrawal levels and known gold flows plus domestic supply. With India perhaps heading also for inwards flows of 1,000 tonnes plus (if one includes smuggled gold, which is thought to be significant), we will again be in the situation where China and India alone will account for virtually all new mined gold production, which looks like coming in this year at perhaps 2% below last year’s estimated annual total of around 3,250 tonnes (See: Top 20 Gold Producing Nations See Small Gain in Output in 2016). This all means that the remainder of global demand needs to be satisfied by recycled gold or from above ground stocks including gold ETFs, central bank holdings and hoarded gold, although the latter tends to be in strong hands and needs a very substantial price increase for any of it to be released. In the context of supplies from ETFs, the recent sales of gold out of GLD, the world’s biggest gold ETF without leading to lower gold prices, may be significant suggesting perhaps a shortfall of physical gold needed to meet Eastern demand. (See: GLD bleeds 71.58 tonnes of gold in just over a month). Thus overall, the latest figures coming out of the SGE, suggest that Chinese demand, which is hugely significant in the global gold demand and pricing scenario, is holding up well in relation to a year ago – indeed may even be a little stronger, although well short of the 2015 calendar year when the full year total for SGE withdrawals totalled nearly 2,600 tonnes – or around 80% of global new mined supply that year. Gold flows into China have been the most significant factor in global supply/demand fundamentals over the past several years. If they continue at current, or higher, levels, as looks likely, they are bound to lead to a significant supply squeeze which will eventually overwhelm the forces which seem to be trying to restrict the yellow metal’s price rises. We suspect that this means gold prices will overall move onwards and upwards, but not without the occasional stutter as has been the case in recent years. 3b Japan 10 year bond yield: FALLS TO +.065%/ GOVERNMENT INTERVENTION !!!! (Japan buying 100% of bond issuance)/Japanese yen vs usa cross now at 114.34/ THIS IS TROUBLESOME AS BANK OF JAPAN IS RUNNING OUT OF BONDS TO BUY./JAPAN 10 YR YIELD FINALLY IN THE POSITIVE/BANK OF JAPAN LOSING CONTROL OF THEIR YIELD CURVE AS THEY PURCHASE ALL BONDS TO GET TO ZERO RATE!! 3j Greek 10 year bond yield FALLS to : 5.48??? 30 SNB (Swiss National Bank) still intervening again in the markets driving down the SF. It is not working: USA/SF this morning 0.9679 as the Swiss Franc is still rising against most currencies. Euro vs SF is 1.1487 well above the floor set by the Swiss Finance Minister. Thomas Jordan, chief of the Swiss National Bank continues to purchase euros trying to lower value of the Swiss Franc. It took stocks only a few minute to “price in” the latest political shock out of Washington, and as of this morning Emini futures no longer care that Mueller has a grand jury, trading 0.08% in the green with European stocks and Asian shares all little changed as investors await the looming July jobs report, which is expected to show a slowdown in hiring from 222K to 180K but will have little impact on either the Fed’s thinking or the market. Stocks, gold and most metals headed for a fourth week of gains on Friday, as fresh political woes for U.S. President Donald Trump and the prospect of a trade war with China kept the dollar depressed ahead of payrolls. The Bloomberg Dollar spot index inched lower for a third day, hovering near the weakest in 15 months, while cable rose to $1.3154, the euro hit a fresh two-and-a-half year high against the dollar and oil retreated. Global stocks were just barely in the green this morning with the MSCI All-Country World Index rising less than 0.05%. In key overnight macro moves, the Aussie dollar gained against the greenback despite RBA warnings about currency’s strength, while the USD/JPY fell as much as 0.2% to 109.85, the weakest since June 15, before paring decline to 110.03. In Asia, Japan’s Topix index slid 0.2% and Australia’s S&P/ASX 200 Index lost 0.3%. South Korea’s Kospi was up 0.5 percent after sliding 1.7 percent on Thursday. Japan’s Nikkei ended the week little changed, dropping 0.4 percent on Friday as a stronger yen weighed. Wall Street was expected to start marginally higher, having seen the Dow index break through 22,000 points this week. Hong Kong’s Hang Seng Index was little changed, while the Shanghai Composite Index swung between gains and losses. European markets got off to an underwhelming start, with Britain’s FTSE 100, Germany’s DAX and France’s CAC 40 all lower. The FTSE was on course for its best week in two months, boosted by the latest tumble in the pound. The Stoxx 600 traded sideways as Swiss Re AG’s profit drop weighed on insurers. The rising Euro, which ING now expects to rise as high as 1.20 in the next 4 weeks, has capped Stoxx gains in recent months, on concerns it will pressure exporter earnings. The U.K.’s FTSE 100 Index gained less than 0.05 percent to the highest in more than a week. Germany’s DAX Index jumped 0.1 percent. The dollar index, which has just recorded its worst run of monthly losses since early 2011, was 0.1 percent lower at 92.766 on the day and about 0.6 percent during a week in which it fell to a 15-month low of 92.548. “We think things are overdone in terms of negative sentiment around the dollar,” said PineBridge Investments fund manager Hani Redha, quoted by Reuters. “Overall we think global growth is going to be quite solid but we think the leadership is going to change back towards the U.S.,” he added, saying Trump was also likely to get at least some fiscal stimulus measures through in the coming months. As SocGen’s Kit Juckes writes this morning, the US Treasury market is heading towards today’s non-farm payroll data with 10s at 2.23%, in the bottom half of their 2.12-2.42 range. The RBA sees lower inflation thanks to the AUD’s rise to date and a threat to growth from further appreciation, Japanese wages fell and even smoothed show the same lack of wage growth as we see everywhere, despite a tightening labour market. Just taking those three bits of information I get a now-familiar snapshot of the world. Anchored US rates and yields will make sure that capital goes on flowing out of dollars and into anything that’s perceived as more interesting. Other central banks will grumble (at the very least) about the weaker dollar trend and in Japan, the need to reboot inflation expectations remains as clear as ever, the difficulty of doing so likewise, and the danger that anchored US yields drag USD/JPY down and is pretty clear too. In rates, Europe’s 10-year benchmark government bond yield and U.S. equivalents were pinned near one-month lows of 0.45 and 2.23% respectively amid the U.S. political uncertainty. U.S. yields have been falling for most of 2017 as the President’s travails have cooled expectations for growth and inflation. 10-year gilt yield +1bps to 1.16% after Bank of England kept rates on hold Thursday. In commodities, West Texas Intermediate crude dipped 0.8 percent to $48.66 a barrel, the lowest in a week. Gold was steady at $1,269 an ounce and set to score and modestly weekly rise, which will be its fourth in a row. Copper advanced 0.2 percent to $2.88 a pound. Payrolls May Show Stable Economy; Grand Jury Issues Russia Subpoenas; HNA Says It’s Not Raising Funds in N.Y.
Holding policy steady consistent with growth and inflation target. Recent increase in AUD has modest dampening effect on economy. Further strength in AUD would reduce economic growth and inflation. RBA maintains inflation forecast for 2017 and 2018 at between 1.5%-2.5% for both, 2019 forecast kept at 2.0%-3.0%. Lowers GDP forecast for 2017 to 2.0%-3.0% from 2.5%-3.5%, 2018 forecast maintained at 2.75%-3.75%, while 2019 forecast was increased to 3.0%-4.0%. The majority of EU bourses have come off worst levels, and now trade in marginal green territory. The biggest movers throughout the European morning have been UK Home Building names, with an overnight article from “PropertyWeek” circulating, which states that the Government is reviewing its ‘Help to Buy’ Scheme. Taylor Wimpey (TW LN) and Perisimmon (PSN LN) shares were both down over 5% for the session, as the former generated 45% of its sales from the Scheme. Later reports from a UK government spokesperson stated that it is incorrect to infer that the government are set to cancel the help to buy scheme, did see many of the loses retraced. NFP Friday trade has been evident in fixed income. markets today, with the 1 Oy bund holding its slim range. Underperformance has been seen in peripherals, with delays relaying slight profit taking in BTPs and Bonos. Corporate issuance once again came into fruition today, with Verizon printing AUD 2.2bn “kangaroo” bond, with BAT mandating banks for a multi-currency and multi-tranch bond deal. In currencies, GBP has seen the majority of volatility this morning as EUR/GBP and GBP/USD both briefly broke out of the post EU trading range. Elsewhere, overnight volatility was seen in AUD, following the release of the RBA’s statement of Monetary Policy, with no fears of an overvalued currency, AUD/USD begun to gain some bullish pressure, we have continued to see buying following the bounce of August’s low, with bulls now looking to retest 0.80. USD & CAD will both await their jobs reports due at 13.30BST. However, it is worth noting the greenback did once again see concerning news as political tensions continue with US Special Counsel Mueller empanelling a Washington Grand Jury in Russia probe. In commodities, Asian oil demand has been seen to shift back to the Middle East and Russia in Q4 following the recent rise in Brent. Elsewhere, OPEC has delivered a record high adherence to its oil cut in 2017, struggles do remain with Iraq and the UAE yet to show how they can meet their targets. Trade yesterday saw the USD 50.00/bbl level hold once again and the rejection has leaked into trade today, with WTI now trading around USD 48.80. Precious metals all trade in marginal positive territory, likely abiding to the risk tone following the recent acceleration in the US Russian probe. Looking at the day ahead, Friday is relatively quiet day for data in both Asia and Europe with only German factory orders data for June due and Italy’s retail sales for June. The US will be in greater focus as the July nonfarm payrolls number is due (180k expected) along with other labor market data. Alongside that, we will also get the trade balance reading for June. Onto other events, the Baker Hughes US rig count will also be out. Notable US companies reporting include: Cigna, Berkshire Hathaway and CBOE. Notable European companies reporting include: Allianz, Swiss Re and Erste Group. Hello Payrolls Friday. On a day we pore over how many people have been employed and how much they’ve been paid in the US, I’m still trying to come to terms with the €222 million buy out clause activated for the transfer of Brazilian Neymar from Barcelona to PSG. This is broadly equivalent to the annual GDP of the equatorial Marshall Islands (population over 53k) which is around the 190th biggest nation in the world. If you include his wages over a 5 year contract you can nearly double this and you get close to the annual GDP of Tonga – home to over 100k people. The Marshall Islands aren’t a hot bed of economic activity although I did note that their income tax rates are 8% and 12% and corporation tax is at 3%. Anyone coming with me to set up a company? Although make sure you can afford your current buy-out first though. Back to US jobs and consensus expectations are for a 180k gain (222k previous) today. Our US economists project a more optimistic figure of 200k for headline and private payrolls, which they expect to be sufficient to lower the unemployment rate a tenth to 4.3%. However, they note that the July ADP survey and the employment subcomponents of the manufacturing and non-manufacturing ISMs add some downside risks to their forecast as their payrolls model (which uses the first reported values of ADP and the ISM composite employment reading) projects private payroll gains of around 165k. Counterbalancing this risk however is the fact that private payrolls have recently fallen short of the levels implied by ADP and the ISMs, and payrolls (including revisions) have accelerated in the past following similar misses. On other detail aspects of the report, they expect that hours worked should remain steady at 34.5 along with a 0.3% gain in average hourly earnings (AHEs), which would lower the YoY growth rate of the series to 2.4% (with a risk of rounding up and remaining at 2.5%). However, as long as there is no material surprise in either direction, they do not expect this month’s AHEs to meaningfully impact policymakers’ intermediate-term inflation expectations. Finally, the team notes that even if July payrolls fall below their forecast, Amazon’s hiring spree this month could result in an upside surprise in next month’s (August) data, which will likely factor more prominently into the Fed’s decision process going into the September 20 meeting. So another report where the market will look for any life in inflation and a reason for bonds to sell-off. This report comes on the back of a sizeable bond rally yesterday which seemed to be kickstarted by a relatively downbeat outlook from Mr Carney on a day the BoE cut their growth and wages forecast. Before we review this it’s worth highlighting that the Wall Street Journal reported 30 minutes before the US close that Special Counsel Robert Mueller was said to have impaneled a grand jury in the ongoing Russia probe. It led to a small spike lower in risk (see below) into the close and it’s another cloud for the Trump presidency to contend with. Back to the BoE. As widely expected, the Bank left rates steady at 0.25% with the number of dissent votes declining from three to two, due to Kristin Forbes’ departure. The Bank reiterated future policy may need to be tightened slightly more than the current market yield curve implies (the first hike is priced in 2H18), but DB’s Mark Wall notes that Governor Carney made no attempt during the press conference to re-price dovish market expectations for this year. In Carney’s opinion, the UK was still experiencing exceptional circumstances ‘and would do so for some time’, with Brexit-related risks to the forefront. The bank has also cut its economic growth projections to 1.7% in 2017 (vs. 1.9% previous) and 1.6% in 2018 (vs. 1.7% previous). Looking ahead, with two new members on the MPC as of the September meeting, our team think it will be difficult for the hawks to gain a majority on the MPC without the support of the Governor. So our team continues to expect the BoE to NOT tighten monetary policy until Brexit related uncertainty has been sufficiently reduced. Post the BOE release, Gilt yields dropped ~5bps in 10 mins of trading and continued to fall to close 9bps lower for the day. The more dovish rates outlook and cautious comments from Carney had a similar impact across most government bond markets with Gilts (2Y: -6bp; 10Y: -9bps), USTs (2Y: -2bps; 10Y: -5bps) and German bunds (2Y: +1bp; 10Y: -3bps) yields mostly notably lower. Elsewhere changes were a bit more modest with Italian BTPs (2Y: unch; 10Y: -2bps) and OATs (2Y: +1; 10Y: -3bp). Turning to currencies there was a fair bit of intraday activity for Sterling after the meeting. It traded as high as 1.1202 in the morning session against the Euro, but then fell to as low as 1.1052 in the hours after the BoE announcement, before closing at 1.1069 for the day (-0.7% for the day). Sterling/USD also had similar intraday trends, before closing down -0.6% for the day. For other currencies, the USD dollar index dipped 0.2%, partly due to the softer ISM non-manufacturing data and the Euro/USD edged 0.1% higher. In commodities, WTI oil fell 1.3% as investors weighed up reports of rising US production against a decline in crude stockpiles. Elsewhere, precious metals were slightly up (Gold +0.1%, Silver +0.2%), copper was flat, but aluminium fell 0.8%. Onto equities, the S&P also had its share of intraday action. The index was trading in a tight range for most of the day, but then fell ~0.3% post the Mueller news and closed -0.2% down for the day. The VIX also responded, rising ~+5.5% around that time to 10.5 but closed a bit lower at 10.44. Elsewhere, the Dow edged up ~+0.1%, breaking another fresh all-time high for the 7th consecutive day. Within the S&P, modest gains in the industrials and utilities sectors were more than offset by losses in energy (-1.3%) and materials (-0.7%). European markets broadly strengthened, the Stoxx 600 edged up 0.1%, the FTSE 100 up 0.9% (helped by the fx move) and the CAC (+0.5%), but the DAX fell 0.2%, impacted by Siemens (-3%). Away from the markets, as noted earlier, the WSJ has reported that Special Counsel Mueller has impaneled a grand jury as part of his probe into Russia’s interference in the US election and possible ties with President Trump’s campaign. A grand jury suggests that the probe has gone beyond investigating what might have happened, to potentially charging people with crimes. Mueller’s office has declined to comment. However, a special counsel to the president (Ty Cobb) added later that he wasn’t aware that Mueller was using a grand jury, but also acknowledged that “…grand jury matters are typically secret…”. Elsewhere, US senators have introduced two bipartisan bills aimed at protecting Mueller on concerns that Mr Trump may look to dismiss him. We shall no doubt see more news flow on this in the coming weeks. This morning in Asia, markets are mixed but little changed. The Nikkei is -0.4%, the Kospi recovering slightly (+0.2%) after yesterday’s -1.7% fall, with the Hang Seng flat and China slightly higher on balance. Before we take a look at today’s calendar, we wrap up with other data releases from yesterday. In the US, data was in line to slightly soft. The ISM nonmanufacturing composite for July was below expectations at 53.9 (vs. 56.9 expected; 57.4 previous), which is the lowest level since a similar downward spike in August last year. Digging into the details, new orders index fell 5.4pt to 55.1 and the employment index fell 2.2pt to 53.6. However, even after factoring in the employment indices from the twin ISM reports together, DB’s economist believes the employment indicators are still consistent with decent payrolls growth (~200k per month). Elsewhere, factory orders for June was in line at 3%, initial jobless claims for July was slightly lower than expectations at 240k (vs. 243k) and continuing claims was at 1,968k (vs. 1,958k expected). The final durable goods order stat for June was reported higher at 6.4% (vs. 0% expected). Onto Europe and the June Eurozone retail sales were higher than expectations at 0.5% mom (vs. 0% expected) and 3.1% yoy (vs. 2.5% expected), while UK’s Markit services and composite PMI were also a tad higher than expectations at 53.8 (vs. 53.6) and 54.1 (vs. 53.8) respectively. Elsewhere, the final July services and composite PMI for the Eurozone (-0.1pt vs flash composite), France (-0.1pt) and Germany (-0.4pt) were also released and was slightly lower than the flash PMIs. Looking at the day ahead, Friday is relatively quiet day for data in both Asia and Europe with only German factory orders data for June due (0.5% mom, 4.4% yoy expected) and Italy’s retail sales for June (0.1% mom expected). The US will be in greater focus as the July nonfarm payrolls number is due (180k expected, DB 200k) along with other labour market data. Alongside that, we will also get the trade balance reading for June. Onto other events, the Baker Hughes US rig count will also be out. Notable US companies reporting include: Cigna, Berkshire Hathaway and CBOE. Notable European companies reporting include: Allianz, Swiss Re and Erste Group. The European Central Bank now owns 14.8% of all eligible European corporate bonds. However, as WolfStreet.com’s Wolf Richter points out the ECB’s efforts to buy corporate bonds as part of its stupendous asset buying binge has not only pushed a number of government bond yields below zero, where investors are guaranteed a loss if they hold the bond to maturity, but it has also done a number – perhaps even a bigger one – on the euro junk-bond market. It has totally gone nuts. Or rather the humans and algorithms that make the buying decisions have gone nuts. The average junk bond yield has dropped to an all-time record low of 2.42%. These bonds include the riskiest bonds out there. Plenty of them will default, and losses will be painful, and investors – these humans and algos – know this too. This is not a secret. That’s why these bonds are rated below investment grade. But these buyers don’t mind. They’re institutional investors managing other people’s money, and they don’t need to mind. It’s perfectly good to invest in risky instruments as long as you’re being paid to take those risks or have a chance to make serious money. If you buy gold and silver bullion, you know you could make or lose a lot of money. 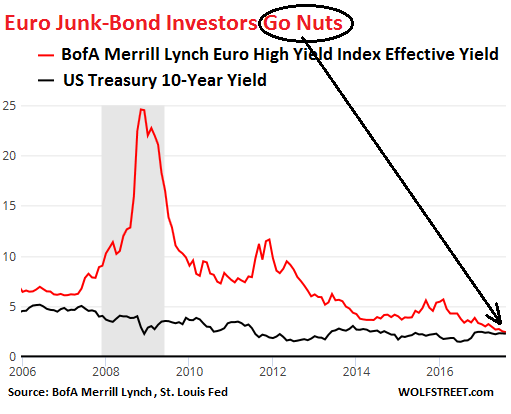 But at a yield of 2.42%, these junk bonds will never make any money if you hold them to maturity, except for covering mild inflation. The risk of losses – including from default – are large. And investors are not getting paid to take those risks. It’s one of the most obviously lopsided deals out there. The average yield of these junk bonds never dropped below 5% until October 2013. 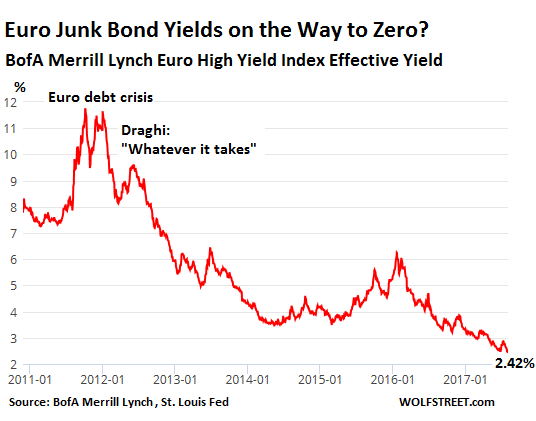 In the summer of 2012, during the dog days of the debt crisis when Draghi pronounced the magic words that he’d do “whatever it takes,” these bonds yielded about 9%, which might have been about right. The answer would normally be totally obvious, but not in the Draghi’s nutty bailiwick. That this sort of relentless and blind chase for yield – however fun it may be today – will lead to hair-raising losses later is a given. And we already know who will take those losses: The clients of these institutional investors, the beneficiaries of pension funds and life insurance retirement programs, the hapless owners of bond funds, and the like. 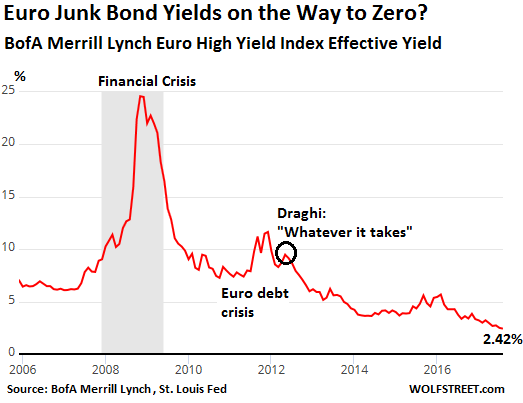 In terms of the broader economy: When no one can price risk anymore, when there’s in fact no apparent difference anymore between euro junk bonds and US Treasuries, then all kinds of bad economic decisions are going to be made and capital is going to get misallocated, and it’s going to be Draghi’s royal mess. The European Commission has decided to broaden sanctions against Moscow on Friday. As RT notes, more Russian individuals and firms accused of delivering Siemens gas turbines to the Crimea have been blacklisted. The updated blacklist includes Russian Deputy Energy Minister Andrey Cherezov, the head of the department of operational control and management in Russia’s electric power industry Evgeniy Grabchak and state firm Technopromexport CEO Sergey Topor-Gilka. As we detailed earlier, this was expected. The European Union is expected Friday to expand sanctions against Russian individuals and companies that were allegedly involved in the transportation of at least four Siemens turbines to Russian-controlled Crimea in violation of an international ban, according to Reuters. “EU states have until later on Friday to submit any complaints to the proposal to extend the Russia blacklist. Two diplomatic sources said it looked like there will be no obstacles and the decision will be taken. The expansion puts the EU – and Germany in particular – in an awkward position: Representatives of the trade bloc have recently expressed outrage at the US over a sanctions bill signed by President Donald Trump that they say could unfairly infringe on the EU-Russia bilateral trade relationship. European Commission Chairman Jean-Claude Juncker earlier this week criticized the US for not consulting the EU before moving ahead with the sanctions bill, threatening reprisals should they damage bilateral trading relations. Trump reluctantly signed the sanctions into law earlier this week after expressing his displeasure with the bill in a signing statement that criticized Congress for further escalating tensions between the two countries. “The Kremlin, dependent on oil and gas revenues, sees the pipelines to Germany and Turkey – Nord Stream 2 and TurkStream – as crucial to increasing its market share in Europe. It also fears that Western partners – needed to develop the deepwater, shale and Arctic gas deposits that will fill the pipelines – will be scared off by sanctions. With this in mind, the Russian gas giant is taking steps to reduce the impact of sanctions, even as the heightened risks are expected to drive up costs and make it more difficult for Gazprom, the Russian oil giant that’s building the German Nordstream 2 pipeline. “The price of any project automatically increases,” said Tatiana Mitrova, director of the Skolkovo Energy Center. Siemens, which insists that it was unaware that the turbines had been moved, has said in statements to the media that it was used as an “unwitting pawn” to help fulfill a promise made by Russian President Vladimir Putin to the people of Crimea. The company is calling for criminal charges to be filed against any Russians who helped orchestrate the move. Siemens originally sold the turbines to a Russian firm called Technopromexport. The Kremlin has now responded… and agrees with Trump. “We fully agree with this opinion,” Dmitry Peskov told reporters on Friday. Peskov also remarked on the ongoing investigation in the US of alleged collusion between the Trump campaign and the Kremlin. Still, as we are sure everyone on the Left believes, that’s exactly what they would say if they were trying to distract from the obvious facts that they meddled in the US election. Congressional investigators have dragged Jared Kushner, Donald Trump Jr. and Paul Manafort to grill them about a now-infamous June 2016 meeting at Trump Tower that is at the center of the Democrats’ dubious narrative that the Trump campaign somehow colluded with the Russian government to tilt the election in Trump’s favor. But for whatever reasons, they have no interest in speaking with anyone from the Russian side, including Natalia Veselnitskaya, the Russian lawyer at the center of the meeting. Veselnitskaya revealed as much during a 10-minute interview with the Russian news program Vesti, saying she sought the meeting as part of her efforts to help Russian businessman Denis Katsyv, a client of hers who was targeted with sanctions through the Magnitsky Act. Neither Hillary Clinton, nor the Trump campaign were discussed during the meeting, she said. “It was a private meeting,” Ms. Veselnitskaya told the interviewer, according to an account Friday in the Moscow Times. She expressed frustration that US investigators have not asked for her side of the story, telling her audience that the US Congress isn’t interested in the truth. Mr. Veselnitskaya also complained that she had not been invited to testify at any of the hearings of the multiple House and Senate committees looking into the Trump-Russia collusion charges. She also criticized Russian investment manager William Browder, an opponent of President Vladimir Putin. Browder. Browder led the lobbying effort to pass the Magnitsky Act, which pressed sanctions against several high-ranking Russian officials who US officials say had a hand in the death of Sergei Magnitsky. Magnitsky, who once worked closely with Browder at his firm, Moscow-based Hermitage Capital, died in custody after purportedly uncovering wide-ranging theft from the state committed by government officials.In response to the passage of the Magnitsky Act, Putin banned US adoptions of Russian children. Veselnitskaya complained that Browder was invited to testify before the Senate Judiciary Committee last week. During the hearing, Browder provided details about collusion involving the Russian government. But the co-conspirator wasn’t Trump, but rather the Clinton campaign. In a segment of the testimony that was largely ignored by the mainstream press, Browder said that the opposition-research firm Fusion GPS had received funding from the Russians to compile a bogus dossier that suggested the Russians had embarrassing dirt on Trump. It was this dossier, which somehow found its way into the hands of the FBI, that triggered the collusion investigations before being widely discredited. She was harshly critical of William Browder, the head of Moscow investment firm Hermitage Capital Management, who successfully lobbied for U.S. sanctions on Russia after a Hermitage lawyer, Sergei Magnitsky, died in custody in Moscow in 2009 while facing charges for questionable tax evasion charges. Mr. Browder told a Senate Judiciary Committee hearing looking into the Russian collusion charges July 27 that Ms. Veselnitskaya and other Russians at the June 2016 meeting were there representing Russian President Vladimir Putin and were trying to set up links to the Trump campaign. “The Russian government and Vladimir Putin were in effect coming to this meeting,” Mr. Browder said. Veselnitskaya’s meeting with Trump Jr., Kushner and Manafort has become a focus for Special Counsel Robert Mueller and Congressional investigators because of an email exchange between Trump Jr. and British publicist Rob Goldstone. In it, Goldstone promised Trump Jr. a meeting with a “Russian government lawyer” who could provide damaging information about Hillary Clinton. Yesterday, I commented on “transitory” factors holding down inflation. Today, the Wall Street Journal reports Global Inflation Hits Lowest Level Since 2009. The Organization for Economic Cooperation and Development said Thursday that consumer prices across the G-20—the countries that account for most of the world’s economic activity—were 2% higher than a year earlier. The last time inflation was lower was in October 2009, when it stood at 1.7%, as the world started to emerge from the sharp economic downturn that followed the global financial crisis. The contrast between then and now highlights the mystery facing central bankers in developed economies as they attempt to raise inflation to their targets, which they have persistently undershot in recent years. According to central bankers, inflation is generated by the gap between the demand for goods and services and the economy’s ability to supply them. As the economy grows and demand strengthens, that output gap should narrow and prices should rise. Right now, the reverse appears to be happening. Across the G-20, economic growth firmed in the final three months of 2016 and stayed at that faster pace in the first three months of 2017. Growth figures for the second quarter are incomplete, but those available for the U.S., the eurozone and China don’t point to a slowdown. Indeed, Capital Economics estimates that on an annualized basis, global economic growth picked up to 3.7% in the three months to June from 3.2% in the first quarter. Central bankers in developed economies are puzzled by the sluggish pace of pay rises, given continuing declines in jobless rates. However, they believe that economic growth will ultimately eliminate the gap between what their economies can produce and what they are now producing, supporting wages and prices. Central banks are puzzled because they do not know what inflation is, or how to measure it. For example, instead of using home prices in the CPI, they now use Owners’ Equivalent Rent. In general, asset prices do not count. Bubbles in stocks and bonds do not count. The massive global QE liquidity went someone, as money always does. The liquidity did not go where the central bankers wanted. It went into asset bubbles. It’s no mystery why central bankers are mystified: Collectively, they are economically illiterate fools engaged in Keynesian and Monetarist group think. 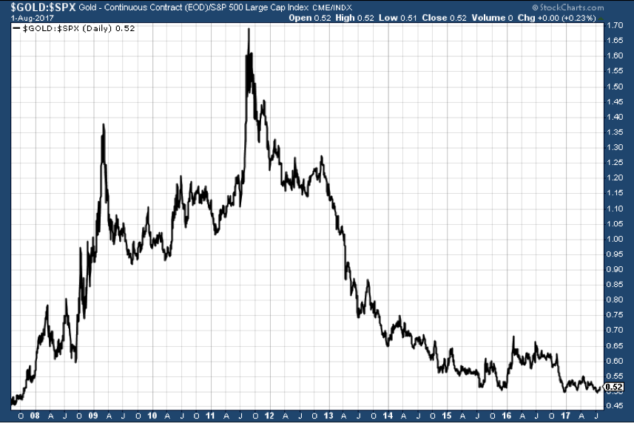 On deck is another round of destructive asset price deflation, brought about by Central banks who cannot see the obvious. The pace of US oil rig count growth has slowed dramatically in the last six weeks as the lagged response to oil prices indicated. While US oil production continues to trend higher, in lagged response to the rise in rigs, it is also nearing its apex. However, four U.S. shale companies recently reported second-quarter production that beat targets and increased their respective full-year output growth guidance. Crude Production (in the Lower 48) topped 9mm last week for the first time since July 2015, and this week it rose once again to a new cycle high…but judging by the slowdown in rig count growth, production may be set to slow. However, despite the slowdown in US oil rig count growth, OilPrice.com’s Tsvetana Paraskova notes that US shale heavyweights are set to boost production this year. In a sign that the U.S. shale patch is boosting output that has been keeping a lid on oil prices, four U.S. shale companies reported second-quarter production that beat targets and increased their respective full-year output growth guidance. EOG Resourcesreported on Tuesday Q2 total crude oil volumes rising 25 percent to 334,700 barrels of oil per day, setting a company oil production record. The company raised its full-year 2017 U.S. crude oil growth target to 20 percent from 18 percent and total company production growth target to seven percent from five percent, keeping capital spending plans intact. “EOG can continue to grow at strong rates within cash flow,” Chairman and CEO Bill Thomas said. Devon Energybeat its midpoint guidance with Q2 net production averaging 536,000 oil-equivalent barrels per day, and said that it was on track to achieve its full-year 2017 production targets. The company cut full-year capital outlook by US$100 million, citing “strong capital efficiencies” and saying it is keeping planned drilling activity for the year. Diamondback Energyreported Q2 2017 production 25 percent higher than in Q1 2017, and raised full-year production guidance by 5 percent. Newfield Exploration Company also beat its production targets and increased the mid-point of its full-year 2017 domestic production outlook. Newfield Exploration now estimates that its year-over-year domestic production growth, adjusted for prior-year asset sales, will be around 8 percent. “In the best parts of the basins, shale is here to stay,” Rob Thummel, managing director at Leawood, Kansas-based Tortoise Capital Advisors LLC, told Bloomberg, commenting on the shale drillers’ Q2 updates and guidance. U.S. drillers expect to continue raising production this year, but some are adjusting spending to the expected cash flows in the current oil price environment, after prices failed to rise as much as analysts and investors had expected a few months ago. “$50 a barrel is still a pretty critical number and that number is going to be even more critical as we move into next year,” Tortoise Capital Advisors’ Thummel told Bloomberg, noting that the lower oil prices could mean that companies would not hedge production as much as they would at higher prices to protect future output. Furthermore, OPEC compliance with production cuts agreed last year fell to 86 percent in July, according to a Bloomberg survey published on Aug. 1. That’s the second consecutive monthly drop — now at the lowest since January — and is down from 105 percent in April and May. OPEC output rose by 210,000 barrels to 32.87 million barrels a day in July, driven by Libya, which added 180,000 barrels a day. Early FRIDAY morning USA 10 year bond yield: 2.2317% !!! UP 2 IN POINTS from THURSDAY night in basis points and it is trading JUST BELOW resistance at 2.27-2.32%. The 30 yr bond yield 2.810, UP 2 IN BASIS POINTS from THURSDAY night. USA dollar index early FRIDAY morning: 92.80 DOWN 4 CENT(S) from THURSDAY’s close. the Italian 10 yr bond yield is trading 54 points HIGHER than Spain. The Loonie was the week’s biggest loser against the greenback and the Euro the biggest winner..
the official jobs numbers: a beat by 209,000 jobs. All of the gains were of the “seasonable adjustment” category. Adjusted saw a 1.3 million decline. Shear nonsense! And now the dovish Fed has another problem: the BLS reports that in July the US added 209K jobs, beating consensus expectations of a 180K print, while June was revised higher to 231K from 222K, even as May was revised modestly lower from 152K to 145K, for a net gain of +2,000 in the prior two months. Nonfarm private payrolls rose 209k vs last month’s 194k, and above the estimate of 180k, as the drop from durable manufacturing failed to materialize. In a familiar refrain, bars and restaurants hired the most workers of any sector in July. Of course, keep in mind that the July gain was all in the seasonal adjustment factor: unadjusted, jobs declined by 1.308 million. The average workweek for all employees on private nonfarm payrolls was unchanged at 34.5 hours in July. In manufacturing, the workweek was also unchanged at 40.9 hours, and overtime remained at 3.3 hours. Adding to the hawkish pressure, wages rebounded from last month’s 0.2%, rising 0.3% M/M, and 2.5% on a Y/Y basis, above the 2.4% expected, while average weekly earnings rose from 2.8% in line with the highest print over the past 7 years, and once again putting wage inflation back on the map. The unemployment rate dropped from 4.4% to 4.3% as expected, while the participation rate rose from 62.8% to 62.9%, as the number of workers out of the labor force declined by 156K to 94.657 million. That said, the gap between the unemployment rate and the unemployment to population ratio remains wide. Total nonfarm payroll employment increased by 209,000 in July. Job gains occurred in food services and drinking places, professional and business services, and health care. Employment growth has averaged 184,000 per month thus far this year, in line with the average monthly gain in 2016 (+187,000). Employment in food services and drinking places rose by 53,000 in July. The industry has added 313,000 jobs over the year. Professional and business services added 49,000 jobs in July, in line with its average monthly job gain over the prior 12 months. In July, health care employment increased by 39,000, with job gains occurring in ambulatory health care services (+30,000) and hospitals (+7,000). Health care has added 327,000 jobs over the past year. Employment in mining was essentially unchanged in July (+1,000). From a recent low in October 2016 through June, the industry had added an average of 7,000 jobs per month. Employment in other major industries, including construction, manufacturing, wholesale trade, retail trade, transportation and warehousing, information, financial activities, and government, showed little change over the month. The average workweek for all employees on private nonfarm payrolls was unchanged at 34.5 hours in July. In manufacturing, the workweek was also unchanged at 40.9 hours, and overtime remained at 3.3 hours. The average workweek for production and nonsupervisory employees on private nonfarm payrolls was 33.7 hours for the fourth consecutive month. In July, average hourly earnings for all employees on private nonfarm payrolls rose by 9 cents to $26.36. Over the year, average hourly earnings have risen by 65 cents, or 2.5 percent. In July, average hourly earnings of private-sector production and nonsupervisory employees increased by 6 cents to $22.10. We already showed that contrary to the strong headline payrolls print, the sole source of job gains in July was part-time jobs, which rose by 393K in the month, the biggest monthly increase since September 2016, as full-time jobs sunk by 54K. Which is why it should not surprise that of the 209K jobs added according to the Establishment survey, the sector that added the most jobs was the “food services and drinking places“, i.e. “waiters and barenders” category, which added 53,000 jobs, the highest monthly increase since March 2014. There have now been 89 consecutive months without a decline for waiter and bartender jobs, the strongest sector for US employment. Needless to say, these jobs fall within leisure and hospitality, that sector pays the worst wages, an average of $13.35 an hour, and $331.08 a week. Next was professional and business services, which added 49,000 jobs. Within this category, administrative and waste services added 30,000 jobs, while temp workers rose by 14,700. The good news here is that hourly pay for this group averaged $26.07, and weekly pay $928.09, up 2.5% from a year ago. The bad news is that most of the jobs were in administrative and temp services, the lowest paying groupings. Health care added 39,000 jobs, with job gains occurring in ambulatory health care services (+30,000) and hospitals (+7,000). Health care has added 327,000 jobs over the past year. Employment in mining was essentially unchanged in July (+1,000). While no other sector made a significant contribution to the July report, it is worth pointing out that for the second consecutive month there wasn’t a major job sector with a decline in jobs. On the surface the July jobs report was solid, with 209K jobs added, more than the expected, as the recent auto sector slowdown appears to skip the labor market (for now), with Trump quick to take credit for the report. However, digging through the numbers reveals some troubling features: while the Household survey reported that an impressive 345K jobs were added, more than 50% higher than the Establishment survey, the bulk of these jobs was part-time. According to the BLS, in July 393,000 part time jobs were added, offset by a drop of 54,000 full-time workers. This was the biggest increase in part-time jobs going back to September 2016. Having monopolized the retail sector (and branching out to others), is Amazon – which recently hired 10 part time jobs for every full time job – starting to dominated the lobs report next? In its latest, July, snapshot of the US economy, the NY Fed observed something startling, and which hasn’t received much discussion in the media: when looking at the June report, over the past year the only employment gains have gone to less educated Americans, or as the NY Fed puts it, “over the last year, the employment-to-population ratio has risen for the less educated.” It added that “for those with less than a high school degree and for high school graduates, the employment-to-population ratio rose by 0.4 percentage point and 0.9 percentage point, respectively. Now that we have the July data we can update the NY Fed data, and find… more of the same: as the chart below shows, while on both a 1-month and 1-year basis, the Employment-to-Population ratio for workers with “some college” or “a bachelor’s degree and higher” declined or remained flat again, the biggest increase on both a 1-month and 1-year basis was for those with “less than a high school diploma” or “high school” graduates. In retrospect, this should not come as a surprise: in an economy where wage growth is “inexplicably” failing to materialize, in which waiters and bartenders were the hottest hiring sector last month and over the past 7 years, and where part-time workers soared in July, it makes sense that the best job prospects are for those who never went to college. As for the adverse structural consequences for the US economy as a result of lack of demand for those with a college education, that is self-explanatory and is a giant hint as to the unprecedented collapse in US economic productivity in recent years. The last word on the phony jobs report courtesy of Dave Kranzler. One of the key numbers of the fake phony numbers is the Birth Death plug. For our newcomers, the BLS records the losses of jobs when businesses die (Death), then they pick out of thin air, their guess as to new businesses created. The net difference is the B/D and even though there has been a huge decline in new businesses over the past 40 years, these bozos always give a huge increase and this is a total falsehood. To give you the absurdity of the numbers; this week, the construction industry report showed a huge 10% drop in June. The bozos in the B/D added 10,000 construction jobs in June. the real answer then for the jobs report is huge decline in meaningful jobs. With the release of the latest BLSBS at 8:30am EST, the market interventionists were set up for a spectacular effort today. The S&P was first out of the gate, to the upside of course, and the precious metals were slammed. Ironically, the impulse triggered by the headline jobs report should have effected the stock market and the precious metals similarly. How are 100’s of thousands of working age people leaving the labor force yet, somehow, the BLS can report hundreds of thousands of new jobs that were filled? Well, there is the “Birth/Death Model”. The Birth/Death Model, much like the Federal Reserve Note, is just made up out of thin air. A number is determined by the Bureau of Labor Statistics and then entered into the BLS report. It has nothing to do with reality. 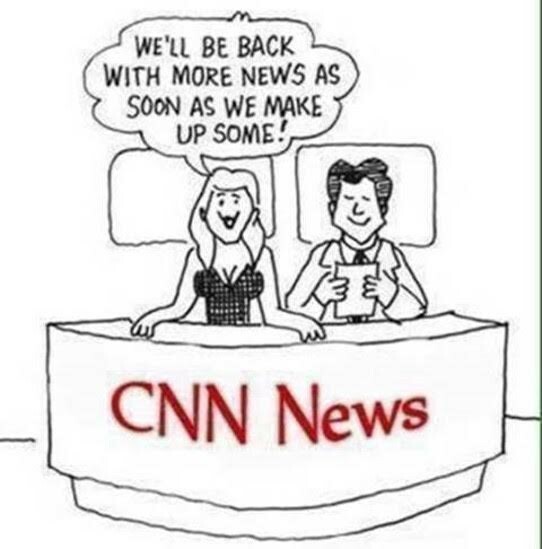 But someone forgot to tell the BLS that construction spending in June was down nearly 10% year over year from last June because the BLS reports that new construction businesses added 11,000 new jobs to the economy – an economic and statistical extreme improbability. We should be scared to death that Sally Q. Yates served as a prosecutor in the Justice (sic) Department for 27 years. In the New York Times, Sally takes high umbrage to Trump’s criticism of his attorney general, Sessions, and blows Trump’s disappointment with Sessions into an attack by Trump on the rule of law. Sally has it backwards. The rule of law is being attacked by the appointment of a special prosecutor to find something on Trump in the absence of any evidence of a crime. In 1940 US attorney general Robert Jackson warned federal prosecutors against “picking the man and then putting investigators to work, to pin some offense on him. It is in this realm – in which the prosecutor picks some person whom he dislikes or desires to embarrass, or selects some group of unpopular persons and then looks for an offense – that the greatest danger of abuse of prosecuting power lies. Robert Jackson has given a perfect description of what is happening to President Trump at the hands of special prosecutor Robert Mueller.Trump is vastly unpopular with the ruling establishment, with the Democrats, with the military/security complex and their bought and paid for Senators, and with the media for proving wrong all the smart people’s prediction that Hillary would win the election in a landslide. From day one this cabal has been out to get Trump, and they have given the task of framing up Trump to Mueller. An honest man would not have accepted the job of chief witch-hunter, which is what Mueller’s job is. The breathless hype of a nonexistent “Russian collusion” has been the lead news story for months despite the fact that no one, not the CIA, not the NSA, not the FBI, not the Director of National Intelligence, can find a scrap of evidence. In desperation, three of the seventeen US intelligence agencies picked a small handful of employees thought to lack integrity and produced an unverified report, absent of any evidence, that the hand-picked handful thought that there might have been a collusion. On the basis of what evidence they do not say. That nothing more substantial than this led to a special prosecutor shows how totally corrupt justice in America is. Furthermore the baseless charge itself is an absurdity. There is no law against an incoming administration conversing with other governments. Indeed, Trump, Flynn, and whomever should be given medals for quickly moving to smooth Russian feathers ruffled by the reckless Bush and Obama regimes. What good for anyone can come from ceaselessly provoking a nuclear Russian bear? The new Russian sanctions bill passed by Congress is an act of reckless idiocy. It was done without consulting Europe which will bear the cost of the bill and might reject it, thus sending shock waves through the fragile American empire. Congress’ thoughtless bill is a violation of the separation of powers. Foreign policy is the executive branch’s arena. The feckless Obama put the sanctions on. Obviously, if a president can put sanctions on, a president can take sanctions off. Trump should take his case to the American people, not via Twitter, but with a major speech. Fox News and Alex Jones, either of which has a larger audience than CNN and the New York Times, would broadcast Trump’s speech. Trump should make the case that Congress is over-reaching its constitutional authority and also preventing a reduction in dangerous tensions between nuclear powers. Trump should ask the American people forthright if they want to be driven into war with Russia by gratuitous provocation after provocation. Even the Washington Post, an initiator and leader of the breathless “Russian collusion” lie has now published an article, “The quest to Prove Collusion is Crumbling,” that concludes that the entire orchestration is a hoax. So the great “superpower America,” the “exceptional, indispensable country,” has wasted 7 months of a new presidency in a hoax when it could have been repairing the relations with Russia and China that were seriously damaged by the criminal Bush and Obama regimes. What are the utter fools that comprise the American Establishment thinking? Why do the morons want high tensions with the two powers that can remove the United States and its impotent European and British vassals from the face of the earth in a few minutes? Who gains from this? What is wrong with the American people that they cannot understand that they are being driven to their destruction? Insouciant America is clearly not a sufficiently strong term. Where was Sally Q. Yates when US attorney Rudy Giuliani used the presstitute media to frame up Michael Milken and Leona Helmsley? Giuliani never had any valid indictment against Milken but used the media and FBI harassment of Milken’s relatives to force Milken into a plea bargain and then had Milken double-crossed by the bimbo judge, who was denied her reward to the Supreme Court because it came to light that she illegally employed illegal aliens. Today, thanks to the corrupt American media, 99.9% of people who remember the Milken case think that Milken was convicted of insider trading, a charge for which no evidence was ever presented and which was totally absent from the coerced plea bargain that the media helped Giuliani secure. As best I remember my investigation of the Helmsley case, Rudy dropped charges against a corrupt accountant in exchange for false testimony against Helmsley. As I remember, both Judge Robert Bork and Alan Dershowitz, attorneys in the case, told me that the charge of tax evasion against Helmsley was preposterous. The Helmsley hotels were fully depreciated and were surviving by guest rentals alone. If the Helmsleys had wanted to reduce their income tax, all they needed to do was to sell their existing depreciated holdings and purchase other hotels in order to crank up the depreciation that reduces income tax. Whatever Justice (sic) Department case you look at, it stinks to high heaven. It is extremely difficult to find any justice in America. But Sally is certain that President Trump’s criticism of his weak AG means the end of the rule of law in the US. As many on the left would say, the US has never had a rule of law. It has a rule of power. How else do we explain the enormous war crimes of the Clinton, Bush, and Obama regimes, and the war crimes to come from the Trump or successor Pence regime, that never will be tried at Nuremberg? President Donald Trump’s strategy of publicly shaming Attorney General Jeff Sessions to force him to aggressively pursue the leakers who have been a persistent source of agitation for his administration appears to have worked. After announcing during a press conference last month that he wanted Sessions “to go full-bore” in his pursuit of leakers, the “beleaguered” attorney general appears to be doing exactly that. During a live press briefing on Friday that was tantamount to a declaration of war, Sessions said the Department of Justice will be cracking down on leaks of classified information, and is considering subpoenaing journalists to force them to reveal their sources in the Trump administration. Furthermore, the attorney general boasted that scrutiny of leakers is already a priority for the DOJ, claiming that the number of open leak investigations has tripled during the Trump administration. Under the new policy framework, the FBI will create a counterintelligence unit specifically to manage these cases, according to the Hill. “We are taking a stand,” Mr Sessions said. “This culture of leaking must stop,” according to the Financial Times. Sessions said the department will prioritize “unauthorized” disclosures – we assume this means leaks that aren’t a part of official communications department strategy which is…probably all of them – and that the DOJ “will not hesitate” to press criminal charges. “At a press conference with Director of National Intelligence Dan Coats, Sessions announced that the Justice Department, FBI and government intelligence agencies will begin directing resources into the investigations of government leaks and would prioritize prosecuting those that pass sensitive information along to the press. Repeating an oft-used Trump talking point, Sessions said the first amendment doesn’t protect reckless disclosures of sensitive information that ultimately puts lives at risk. According to the Hill, the flood of leaks has angered many who see it as a thinly veiled attempt by the deep state, which continues to be staffed with Obama administration holdovers, to hamstring the president and orchestrate a silent coup. Sessions said his deputy director Rod Rosenstein and incoming FBI director Christopher Wray will oversee the classified leaks investigations. In what the Daily Caller described as an “ominous” statement from Coats, the DNI warned leakers from within the intelligence community that “we will find you” should they continue to distribute classified information. The campaign of damaging leaks carried out by the intelligence communities and Special Counsel Robert Mueller’s team has fostered an atmosphere of hysteria among the American public by offering vague aspersions about collusion with the Russians, but no real evidence. The best example being the disclosure of the June 2016 meeting at Trump Tower that was organized by Donald Trump Jr. and is currently at the center of several of the ongoing probes. Earlier this week, Trump was dealt his latest embarrassment when the Washington Post published transcripts of calls with the leaders of Mexico and Australia earlier this year. When Trump first started attacking Sessions last month, some speculated that the diminutive southerner would never work his way out of the dog house. But judging by Sessions’ aggressive tone, it’s likely his boss will be pleased (we’ll likely hear from Trump, who never misses an opportunity to bash the leakers, shortly). “We expect that our review of the expanded time periods, which adds over three years to the initial review period of approximately four years (May 2011 to mid-2015), and our review and validation efforts for the initial review period,may lead to a significant increase in the identified number of potentially unauthorized accounts. Special Prosecutor Robert Mueller is now in the Grand Jury phase of the Trump witch hunt. It is looking more and more like a “get Trump” at all costs affair. Mueller has many conflicts of interest and is required to be removed by law, and yet nothing is done to stop this circus. Meanwhile, renowned journalist Seymour Hersh says, “Russia Gate is a CIA planted lie and revenge against Trump.” Hersh says DNC staffer Seth Rich supplied some “juicy emails from the DNC” to WikiLeaks. That pretty much blows up the Russian hacking and collusion story. Now, about two dozen members of Congress want a Special Prosecutor to investigate Hillary and all the wrongdoing of the Obama Administration. Former Fed Head Alan Greenspan is warning of a “bond bubble.” Greenspan thinks interest rates are “much too low,” and when they move up, they could move up “reasonably fast.” Even with this warning from a former Federal Reserve Chairman, the stock markets still hit all-time highs this week. Donald Trump and members of the GOP are proposing a new immigration bill that will limit immigration. Trump says it will save “billions and billions of dollars.” The plan will limit unskilled labor and require people who want to become citizens to have skills and speak English. Massive legal and illegal immigration hurts the poor and minorities the hardest.